This interactive workshop session will explore the background to the legislation and the guidance issued in December 2011 by the Information Commissioner’s Office. The session will address some of the key points from the guidance document, including the need for auditing cookie usage and ensuring users are informed in a clear and understandable fashion of why cookies are being used. This session will provide an opportunity for participants to describe approaches being taken locally and explore best practices which may be used within the sector. 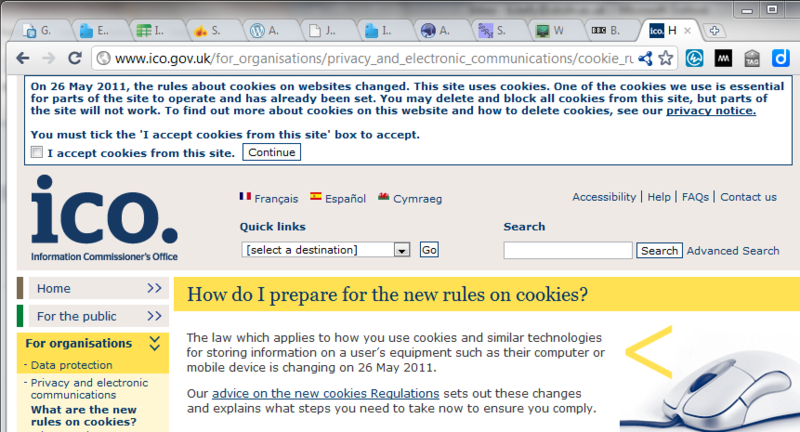 together with an article published in JISC Inform in Spring 2012 which asked The new cookie laws: how aware are you? The work included analysis of the emerging cookie policies and approaches which were being taken initially across the 20 Russell Group universities, which was subsequently extended to other institutions who were willing to update a Google Spreadsheet with links to their cookie policies. The blog posts which were published between December 2011 and May 2012 sought to make others aware of the advice and guidelines being developed by the ICO and suggest how the guidelines could be interpretted by those working in the higher education sector. It was suggested that providing a clear policy on how cookies are being used could be an appropriate response to the legislation, and that institutions may not be required to deploy an opt-in widget across pages on institutional web sites. A few days before the legislation was implemented the government confirmed that such implied consent would be acceptable. It can be risky to implement policies based on a worst case interpretation of legislation. Implementing expensive technical widgets which turn out to be inappropriate may lead to risks that the tabloid press issue FOI requests for the costs of implementing such solutions. It can be advisable to follow approaches taken by one’s peers, rather than developing an implementation plan in isolation. Might, then, the cookie monster have turned out to be benign, but, just as with the Y2K bug, the costs in developing a solution turning out to be the true monster! Wikipedia suggests that the ” total cost of the work done in preparation for Y2K is estimated at over US$300 billion” – although there is a dissenting view. In comparison a Wired article published in April 2012 suggested that Compliance with EU cookie law could cost the UK £10 billion. I’ll conclude by making a point I’ve made previously: there are legitimate needs to address online privacy concerns. However the cookie legislation was a fundamentally flawed approach at addressing such concerns: in many respects cookies provide benefits to end users and the cases which users object to (searches for content being reused in adverts hosted on other web sites which share advertising services) tend, in any case, not to be used across institutional web sites. It would appear that the Do Not Track standard will provide an appropriate technology for legislations to adopt. Institutions should ensure that they gain an understanding of the standard and how it can be used, in particular, develop a browser upgrade plan to ensure that browsers managed within the institution support this standard. The comment described above is worth repeating: “there’s a heap of work being done by some very knowledgable people which negates the need for us to reinvent the wheel in isolation” – so let’s ensure that even more institutions follow the approaches taken by those listed above and have a common approach to addressing legal drivers for the provision of online technologies. UK websites are being given one year to comply with EU cookie laws, the Information Commissioner’s Office has said. The UK government also sought to reassure the industry that there would be “no overnight changes”. The advice was only updated on Thursday, 48 hours before the deadline for implementing the new rules, and published the next day. The do not track header is a proposed HTTP header field that would request a web application to disable their tracking of a user. The “Do Not Track” header was originally proposed in 2009 by researchers Christopher Soghoian, Sid Stamm, and Dan Kaminsky. It is currently being standardized by the W3C. In December 2010, Microsoft announced support for the DNT mechanism in its Internet Explorer 9 web browser. Followed by Mozilla’s Firefox,Apple’s Safari and Opera all later added support. It is not currently supported by Google Chrome, but will be incorporated by the end of 2012. Twitter announced that it will officially support “Do Not Track,” a standardised privacy initiative that has been heavily promoted by the US Federal Trade Commission, online privacy advocates and Mozilla, the non-profit developer of the Firefox web browser. 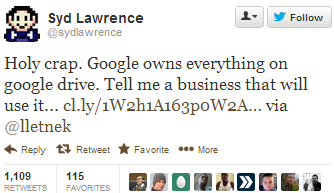 As described in the post on Have You Got Your Free Google Drive, Skydrive & Dropbox Accounts? the announcement of the release of Google Drive generated much discussion, a fair amount of which was due to misinformation about Google’s alleged claims of ownership for content uploaded to Google Drive. However although statements that “Google claim ownership of content uploaded to their service” are clearly wrong, concerns that the terms and conditions can give service providers control over your content and your use of the service in ways you do no approve of do have some validity. In order to gain a better understanding of possible concerns, but also the reasons why service providers may use such clauses, I have documented some of the terms and conditions of services I use in the table below. 1 Statement: We may update these Terms (including our Privacy Statement) from time to time. Changes will have immediate effect from the date of posting on this Site and you should therefore review these Terms regularly. Your continued use of this Site after changes have been made will be taken to indicate that you accept that you are bound by the updated Terms.How they will justify the statement: We may need to change the terms and conditions in light of changing circumstances. What they could mean: Once we’ve got you hooked, we’ll claim your first born! 2 Statement: [We] reserve the right to amend the Acceptable Use Policy at any time without notice. If the policy is amended then all list owners will be informed and they may distribute the information to list members.How they will justify the statement: We may need to change the terms and conditions in light of changing circumstances. What they could mean: Once we’ve got you hooked, we’ll claim your first born – but unlike the other service, we’ll tell you about it. 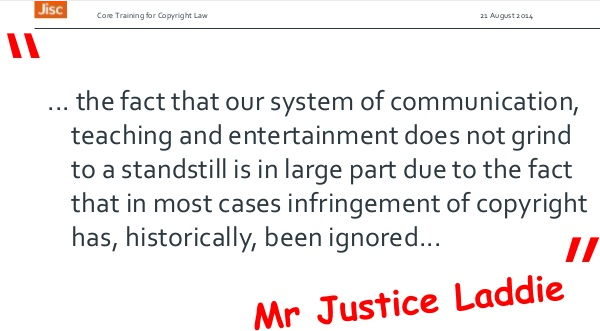 3 Statement: Unacceptable use: … Creation or transmission of material such that this infringes the copyright of another person.How they will justify the statement: We want to ensure that we aren’t sued for copyright infringement. What they could mean: If we don’t like what you’re doing we can use copyright clause to get rid of you. 4 Statement: You must not use … computing services for the creation, collection, storage, downloading or displaying of any offensive, obscene, indecent or menacing images, data or material capable of being resolved into such.How they will justify the statement: This is self-evident. What they could mean: Our lawyers tell us we can use the “material capable of being resolved into such” to scare people. What are your thoughts on these terms and conditions? in order to run a massive online service that handles tons of user data, you need a lot of permissions from those users. Those permissions are fairly standardized, since the underlying copyright law itself is static — companies like Microsoft and Google need permission to copy and distribute your content to servers around the world to make services like Drive and SkyDrive work well. There’s also a tension between friendly language and legal precision — drawing in sharp lines often requires aggressive wording, while there’s real comfort in vagaries. In the end, though, the actual wording of these documents doesn’t reveal much — they all set out to do the same thing, and they all accomplish their goals. What’s most important is how much trust you’re willing to give companies like Google, Microsoft, Apple, and Dropbox as more and more of your data moves to the cloud. Contracts are meaningful and important, but even the most noble promises can easily be broken. It’s actions and history that have consequences, and companies that deal with user data on the web need to start building a history of squeaky-clean behavior before any of us can feel totally comfortable living in the cloud. I suspect the recent flurry of tweets about the Google Drive terms and conditions wasn’t really about the terms and conditions themselves (which apply to all Google services) but were really a statement from people who don’t trust Google. Have You Got Your Free Google Drive, Skydrive & Dropbox Accounts? A few hours ago I visited Microsoft’s Skydrive Web site in order to see if I was entitled to the free upgrade from 7Gb to 25 Gb of storage. As an existing Skydrive users it seems that I was so I’m pleased that I have additional storage space which I can use for transferring files between my mobile devices (iPod Touch and Android phone) and desktop computers. As I describe in a recent post on Paper Accepted for #W4A2012 Conference Skydrive has proved particularly useful for working with my co-authors of the final versions of a peer-reviewed paper which was produced using MS Word. Whilst installing the Skydrive tool on my PC I noticed a tweet which announced that Google Drive had been released. Google Drive, like Skydrive and Dropbox (the utility I normally use for shipping files between various devices) provide cloud storage – and, as described in a BBC News article, Google Drive offers up to 16TB of storage with 5Gb for free – not as much as Microsoft’s offering but, to be fair, I’m getting that deal as an early adopter. There is clearly a discrepancy between the tweet and the terms and conditions: how is “Google owns everything on google drive” reconciled with “You retain ownership of any intellectual property that you hold in that content. In short, what belongs to you stays yours“? We may update these Terms (including our Privacy Statement) from time to time. Changes will have immediate effect from the date of posting on this Site and you should therefore review these Terms regularly. Your continued use of this Site after changes have been made will be taken to indicate that you accept that you are bound by the updated Terms. My view is that I will use these three Cloud storage services for both personal and work-related activities. I’m pleased that Google have been open about the fact that they may modify my content as this will include compressing my files – a Cloud storage service which did not do this would be guilty of using energy unnecessarily: something which should not be done in light of global warming concerns. I’m also happy if Google decide to explore ways in which they can monetise my attention data, just as Facebook do when they observe my interests in beer and sport and present me with a personalised ad. But what if they use the terms and conditions to take a copy of my content and sell it on? I don’t think this is likely, but I do accept that it is risk. I will therefore assess such risks when I make use of the service – and would advise others to take a similar approach if they store content on the service. But I’m also aware of the missed opportunity costs if I don’t use such services. So I’ll use Google Drive, once I’ve been given access to the service. What about you? How is the Higher Education Sector Responding to the Forthcoming Cookie Legislation? A post published in February recommended Next Steps In Addressing Forthcoming Cookie Legislation and described how the sector can benefit by sharing approaches on how institutions are responding to the cookie legislation, which comes into force on 26 May. In order to help identify the ways in which institutions are advising visitors to their web sites on institutional policies on cookie usage a summary of interesting highlights from privacy policies provided by Russell Group Universities (which were surveyed in a post on Privacy Settings For UK Russell Group University Home Pages published in May 2011) together with a number of other universities who provided institutional details to a Google Spreadsheet on UK HEI Privacy Policies is given in the following table. Note that the information provided in this table given below was collected on 13-16 April 2012. 4 Bath Spa University Website terms and conditions of use Y Provides detailed information on specific cookies. Explains why Google Analytics is used and how users can opt out. 5 University of Birmingham Privacy Y Has sections on What information is collected? and What we do with the information? 9 Cranfield University Privacy Via Legal link Explains how “The “Cookie” allows us to track visitors through the website but does not include any personally identifiable information. With most Internet Browsers, you can erase “Cookies” from your computer hard drive, block all “Cookies”, or receive a warning before a “Cookie” is stored.“. 12 University of Glasgow Privacy statement Via link to Disclaimer Provides an explanation of cookies and describes how they are used with Google Analytics. Describes how Google may use the information collected and explains how cookie can be disabled. 14 King’s College London Privacy statement Via link to Terms and Conditions of Use Has sections on How do we collect information? ; What information do we collect? ; How do we use this information? ; Do we use ‘Cookies’? ; How do we protect personal information? ; Will we disclose the information we collect to outside parties? and Your Consent. Has link to detailed page on Cookie use at King’s College London. 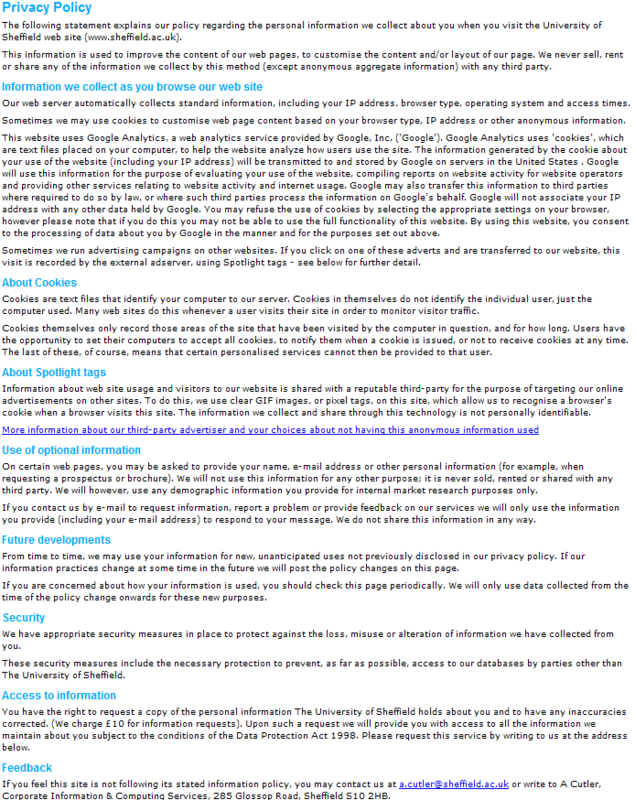 15 University of Leeds Privacy statement Y Has sections on Purpose of this statement; Automated collection of personal information; Non-automated collection; Third-party access; Cookies; Google Analytics and Changes to this statement. 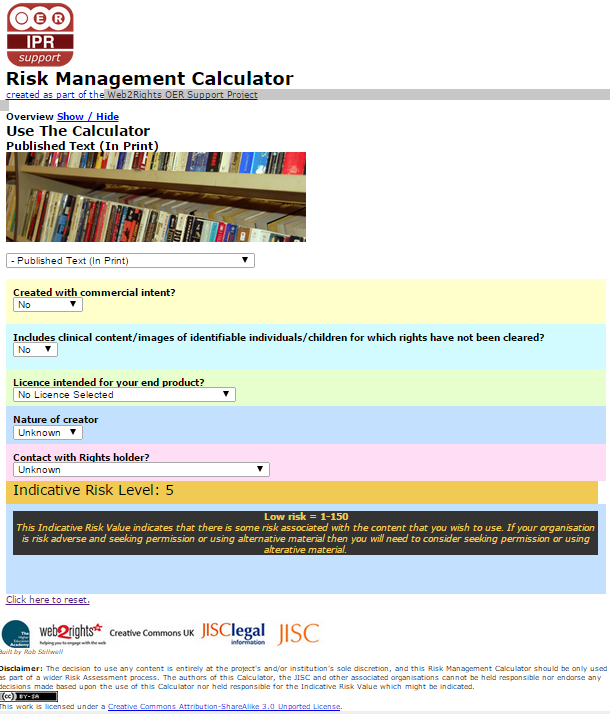 16 University of Liverpool Personal information on the web Via link to Legal, Risk & Compliance Has sections on What information is collected, and how is it used? ; Cookies (including link to All About Cookies); Security and Requests for Access. 20 University of Nottingham Privacy Y Has sections on Information we collect; How we may use the information; Cookies; Security Access Requests and Security. 25 Staffordshire University Protecting Privacy on Data Transmission over the Internet Via link to Legal Has sections on What information is collected and What do we do with the information? Privacy Y Has information on What are cookies? ; Which type of cookie does UWE use? ; UWE cookies and personal information; Blackboard; Web metrics; Can I turn off UWE cookies? and What happens if I switch off UWE cookies?. The approaches which are being taken appear to reflect the pragmatic guidance which has been provided recently. The UK’s data protection watchdog is not likely to take action against the users of data analytics cookies on websites even if they fall foul of new EU rules on cookie consent, it has said. It seems that the government does have an understanding of the need for technical privacy standards such as the W3C’s Tracking Protection Working Group which aims to “improve user privacy and user control by defining mechanisms for expressing user preferences around Web tracking and for blocking or allowing Web tracking elements“. The document adds that “we are keen to ensure that these categories do not become entrenched but rather evolve as industry discovers cookies that need more accurate categorisation” which again emphasis the realistic approaches which are being taken. will not be the prime area of concern for the ICO (although I should add that IANAL) . The ways of addressing privacy policies in a very distributed environment, as can be seen in the approach taken at the University of Cambridge. The detailed technical information about specific cookies which is being provided at institutions such as Bath Spa and King’s College London. The ways in which use of Google Analytics is documented, such as can be seen at Bath Spa and the University of Leeds. The ways in which users are advised to disable Google Analytics, such as can be seen at the University of Glasgow. The popularity of the All About Cookies service for further information about cookies. At the IWMW 2012 event, to be held at the University of Edinburgh on 18-20 June, Claire Gibbons (University of Bradford) and John Kelly (JISC Legal) will be running a 90 minute session on Responding to the Cookie Monster. I wonder if the cookie monster will turn out to be not as scary as we first feared? Are Attitudes Towards Privacy Changing? Liz Lyon, UKOLN Director, recently gave a talk on “The Informatics Transform: Re-engineering Libraries for the Data Decade” at the VALA 2012 conference held in Melbourne, Australia. This talk will present a case for a new and transformative library paradigm which delivers innovative informatics services to support data-intensive research. It will draw on cutting-edge exemplars from open data initiatives, public participation and citizen science, socio-ethical challenges with personal data, policy drivers, emergent scholarly communications and research impact metrics /tools, all of which are radically changing the research landscape. The presentation will explore how libraries can respond to these challenges with novel informatics services, new data support roles and pioneering strategic partnerships. I was particularly interested in the “socio-ethical challenges with personal data” address in the talk. 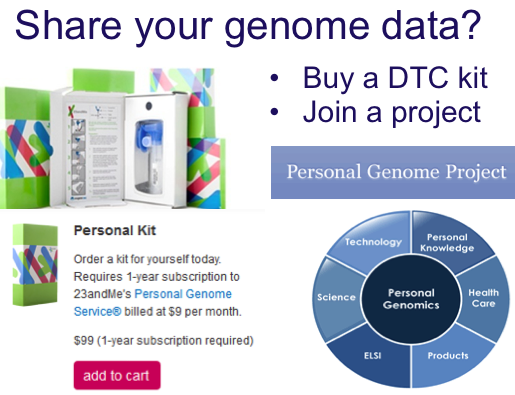 In the talk (and note that a recording of the talk is available) Liz described how a genome kit can be purchased for $99 (or, I discovered, from £59 in the UK). Discover your deep ancestral roots using genetic genealogy. Find out where your ancestors came from, discover their ethnic background, and trace the roots of your surname. Your collection kit will have everything that you need to collect a DNA sample from inside your mouth. It’s fast, painless and simple and very similar to brushing your teeth. The entire process takes just seconds to complete. Does that seem appealing or does it fill you with horror? Do you really want to discover such information which would never have been previously available? And although your personal information may be confidential, will anonymised findings be aggregated to reveal patterns of Viking ancestry around the UK? 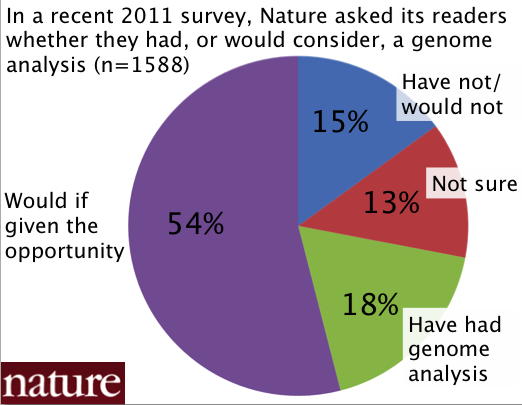 I do wonder whether we are starting to see significantly changing attitudes developing towards privacy issues as technology drives developments not only for genome analyses but also, and more relevant to this blog, revelation of private information whether directly or, through aggregation of data, indirectly? It seems to me that the forthcoming ‘cookie’ legislation will help to gain an understanding of the general public’s concerns over privacy issues. Those who developed the EU cookie directives felt it was important to ensure that users of web sites are made aware of personal information which is stored in cookies. But cookies have been with us since 1994. What if the cookie legislation, and the requirement for users to opt-in to cookies, results in a backlash, with people wishing to go back to the simplicity of today’s environment in which cookies are invisible to most people. It will be interesting to see how users will respond. And I should add that I’m saying this as someone who has a Facebook account and who, several years ago, installed the a Firefox plugin which enables me to block cookies – but has never done so. Indeed using the plugin for the first time in ages I notice that there are currently 18 cookies set. Am I bothered? The answer is no. Should I be? You tell me. Do you block cookies? We all need our privacy! On 26 May 2011 I asked How Should UK Universities Respond to EU Cookie Legislation? The post was published the day before UK government legislation based on the EU Directive requiring users to opt-in to cookie use was due to come into force. However in light of the government’s awareness of the difficulties in conforming with the legislation, the Information Commissioner’s Office (ICO) announced that UK websites were to be being given one year to comply with EU cookie law. But May 2012 is now only three months away, so how are UK Universities responding? One of the key challenges will be in developing policy statements regarding information which is gathered and stored in cookies. Back in May 2011 a survey of cookie use across the twenty Russell Group universities was carried out and the findings published in a post on Privacy Settings For UK Russell Group University Home Pages. Subsequently staff working in institutional web teams across the wider UK higher education sector were invited to provide links to their privacy policies in a Google spreadsheet. The following table provides links to privacy policies and statements based on the information available from the spreadsheet. The links aim to make it easy for people wishing to see the approaches taken by others within the sector to see the approaches which are being taken. In addition to the passive process of seeing what others are doing and making use of approaches which appear useful it can be more useful to collaboratively engage in the development of public privacy statements, such as those listed above, as well as discussions about important issues including approaches to auditing cookie use on web sites; ongoing auditing processes; policies for web sites which are not under the control of a central web team and the internal processes for developing policies and procedures, including reaching agreement on the institution’s willingness to take risks if it is not possibly to conform with the letter of the legislation. Feedback can be provided on the JISCPress site or on this blog. An article published in the Guardian the week before Christmas announced “Hacked climate emails: police seize computers at West Yorkshire home” and went on to describe how “Police officers investigating the theft of thousands of private emails between climate scientists from a University of East Anglia server in 2009 have seized computer equipment belonging to a web content editor based at the University of Leeds“. It seems that “detectives from Norfolk Constabulary entered the home of Roger Tattersall, who writes a climate sceptic blog under the pseudonym TallBloke, and took away two laptops and a broadband router“. I’ve decided to update this blog entry (20 Dec 2011) because it occurs to me that certain things could be misinterpreted, in no small part because of the common language that separates us across various national borders, and differences in the way debate and concepts of free speech operate in different lands. I hope that will be the end of that matter, but it does highlight some additional legal risks related to publishing a blog, beyond the issue of the cookie legislation which was discussed in a recent post. This incident highlights possible reputational risks for an organisation which employs a blogger (even if, as in this case, the blog is published anonymously and is not related to work activities) and risks that impassioned debate may lead to libellous comments being posted. There may be dangers that risk averse institutions may use such incidents as an opportunity to restrict or even ban blogs provided by their staff. In order to minimise such risks it may be advantageous to take a lead in providing a risk register which documents possible risks and ways in which such risks may be minimised. I am in the process of providing a risk register and the draft is given below. I welcome feedback on the risks listed below and the approaches described to minimising the risks. In addition I would welcome suggestions for additional risks which I may have failed to address = and suggestions for how such unforeseen risks can be minimised. Publication of copyrighted materials Blog posts may contain copyrighted materials owned by others. Images, such as screen shots, may be included without formal permission being granted. Where possible, links will be provided to the source. If copyright owners feel that use of their materials is inappropriate, the content will be removed normally within a period of a week. Plagiarism Blog posts may plagiarise content published by others. Where possible links will be provided to content published by others and quoted content will be clearly identified. Publication of inappropriate comments. Inappropriate blog comments may be published. The policy for this blog states that inappropriate comments will be deleted. Loss of content due to changes in WordPress.com policies. WordPress.com may change its policies on content which can be hosted. Alternatively since the service is based in the US the US Government may force content published on this blog to be removed. Since this blog has a technical focus, it is felt unlikely that this will happen. Loss of blog service due to WordPress.com service being unsustainable. The WordPress.com service may go out of business or change its terms and conditions so that the blog cannot continue to be hosted on the service. It is felt unlikely that the WordPress.com service will go out of business in the short term. If the service does go out of business or changes in terms and conditions it is felt that due notice will be given which will allow content to be exported and the blog hosted elsewhere. Damage to blog author’s reputation due to inappropriate posts being published. The author’s professional reputation will be undermined in inappropriate posts are published. The blog’s policy states that “the blog will provide an opportunity for me to ‘think out loud’: i.e. describe speculative ideas, thoughts which may occur to me“. If such thoughts are felt to be inappropriate or if incorrect or inappropriate content is published an apology will be given. 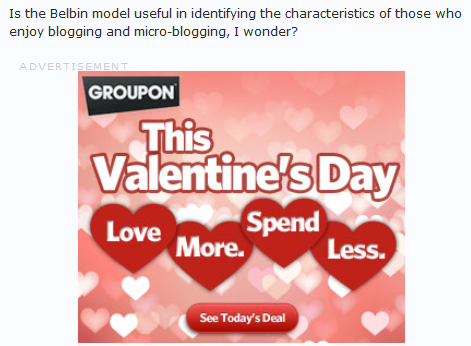 Damage to blog author’s host institution or funder due to inappropriate posts being published. The reputation of the author’s host institution or funder will be undermined in inappropriate posts are published. The author will seek to ensure that the conversational style of the blog does not undermine the position of the author’s host institution or funder. Occasional surveys will be undertaken to ensure that the content provided on the blog is felt to be relevant for the blog’s target audience. Back in May 2011 I asked How Should UK Universities Respond to EU Cookie Legislation? The context to this post was the EU’s Privacy and Communications Directive which officially came into force on 26 May 2011, the day the post was published. However as I described “the good news is that the ICO has recognised the complexities in implementing this legislation” with UK websites being given a year to comply with EU cookie laws. My initial post was followed by a report on a survey of Privacy Settings For UK Russell Group University Home Pages. This helped to identify how cookies are currently being used on the institutional home page for a selected group of institutions, explore a tool which can be used to report on the various types of cookies and to help raise the importance of institutional activity in this area, in particular in identifying cookie usage and ensuring that documentation on such usage is provided for visitors to the institutional web site. Over six months since those two posts were published, how are institutions responding to the year’s grace which the ICO has granted? There has been some discussion on the website-info-mgt JISCMail list on how institutions should respond. Back in May Claire Gibbons, Senior Web and Marketing Manager at the University of Bradford initiated a discussion on the Changes to the rules on using cookies and similar technologies for storing information which seems to have been the liveliest discussion on the list all year. The following month Web managers became aware of the news that 90% of visitors declined ICO website’s opt-out cookie and were worried that implementation of the legislation would result in similar loss of traffic to UK University Web sites. If you have a responsibility for managing a Web site I would advise you to read this 26 page report. However here are some of the key points are given below with my personal comments. The changes to the Directive in 2009 were prompted in part by concerns about online tracking of individuals and the use of spyware. These are not rules designed to restrict the use of particular technologies as such, they are intended to prevent information being stored on people’s computers, and used to recognise them via the device they are using, without their knowledge and agreement. [Page 2] Universities should recognise the benefits of these intention. The initial effort is where the challenge lies – auditing of cookies, resolving problems with reliance on cookies built into existing systems and websites, making sure the information provided to users is clear and putting in place specific measures to obtain consent. [Pages 3-4] A good summary of what institutions need to do. Most importantly user awareness will be likely to increase as people become used to being prompted to read about cookies and make choices. A variety of consumer initiatives – such as the use of icons to highlight specific uses of cookies will also help in this area. [Page 4] User education is key. Setting cookies before users have had the opportunity to look at the information provided about cookies, and make a choice about those cookies, is likely to lead to compliance problems. The Information Commissioner does however recognise that currently many websites set cookies as soon as a user accesses the site. This makes obtaining consent before the cookie is set difficult. Wherever possible the setting of cookies should be delayed until users have had the opportunity to understand what cookies are being used and make their choice. Where this is not possible at present websites should be able to demonstrate that they are doing as much as possible to reduce the amount of time before the user receives information about cookies and is provided with options. A key point here is ensuring that the information you provide is not just clear and comprehensive but also readily available. [Page 6] Guidelines acknowledge difficulties in implementing best practices and provides mechanism for documenting decisions. You should also consider whether users who might make a one-off visit to your site would have a persistent cookie set on their device. If this is the case, you could mitigate any risk that they would object to this by shortening the lifespan of these cookies or, where possible given the purpose for using them, making them session cookies. [Page 6] Guidelines accept that a risk assessment strategy may be appropriate. Government is working with the major browser manufacturers to establish which browser level solutions will be available and when. In future many websites may well be able to rely on the user’s browser settings as part, or all, of the mechanism for satisfying themselves of consent to set cookies. 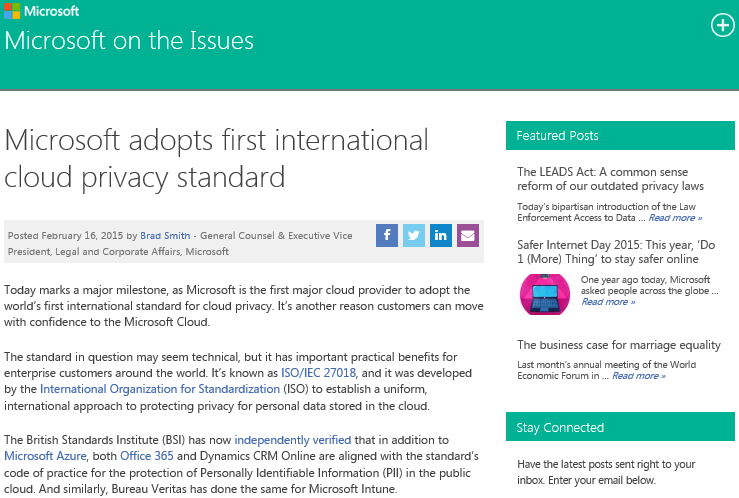 Standards-based privacy solutions provided by browsers will be important in the future. The Information Commissioner will take a practical and proportionate approach to enforcing the rules on cookies. He has to enforce the law, but he does have some discretion in how he exercises his formal enforcement powers. [Page 24] The Commissioner is more likely to take discretion if organisations are shown to be seeking to implement best practices. We will be keeping the situation under review and will consider issuing more detailed advice if appropriate in future. However, we do not intend to issue prescriptive lists on how to comply. You are best placed to work out how to get information to your users, what they will understand and how they would like to show that they consent to what you intend to do. What is clear is that the more directly the setting of a cookie or similar technology relates to the user’s personal information, the more carefully you need to think about how you get consent. [Page 26] Further guidance may be produced in light of experience. In our view the rules do not apply in the same way to intranets. [Page 26] This seems to suggest that the legislation does not cover content which is hosted on Intranets, VLEs, etc. My optimistic interpretation of the guidelines seems to be shared by Matt Jukes who, on the Digital by Default blog, yesterday suggested that we might be seeing A crack in the cookie craziness? Matt felt that “The final entry in the FAQ offers a glimmer of hope for those of us stressing about losing access to our usage data“, although his views were tempered slightly by some concerns that “the wording seems intentionally vague and non-committal” which may “scare a lot of public sector organisations into total compliance“. Overall, however Matt was reassured that the guidelines ” does at least seem to be saying that noone is going to prosecute you for using Google Analytics – especially if you make some concerted effort to inform and educate your users about the existence of those Cookies“. This is the key statement “Which method (of consent) will be appropriate to get for cookies will depend in the first instance on what cookies you use” – In other words- ‘we are not making a blanket ban- check what you are doing, if you are not being evil and creating a profile on the user without them knowing with a persistent cookie, then be sensible, do all that we have told you to do and you will be ok. And to confirm…. As a last point as I know there has been a lot of talk on this, and plenty of scare stories peddled by legal practitioners in particular, make sure you and your bosses are aware as to the enforcement of this (p24 of the report). The ICO will first issue an information notice if they think the organisation is doing something wrong, then ask it to take an “undertaking” notice which asks the organisation to change some practice to comply or an “enforcement” notice to make it comply, only finally if your organisation totally doesn’t listen at all will be fined! In other words, it is about the ICO helping organisations comply and improve rather then jumping out of the blue on organisations naming them as illegal and shutting them down. There are some industries this is going to effect badly…newspapers etc.. but honestly, what you Uni’s do in tracking is very, very low in its privacy implications. Where you need consent – decide what solution to obtain consent will be best in your circumstances. followed by “provid[ing] clear information to users about analytical cookies and take what steps you can to seek their agreement“. Many institutions will use technologies such as Google Analytics for which documentation will need to be provided. In addition there will be other commonly-used systems, such as content management systems, for which shared approaches in documenting information about the purposes of the information being gathered and the approaches to seeking user agreement would be beneficial. This initiative, which is being driven by practitioners, is to be welcomed. Textual information, such as details of policies, processes, etc. can be added to the Google Document on Cookie Policies. In addition a Google Spreadsheet on UK HEI Privacy Policies is also available which can be used to provide links to privacy policies and provide brief comments. Finally Delicious users may wish to add a link to their privacy polices using the privacy-uk-heis tag so that their contribution can be included in an aggregation of tagged resources (although note that following recent changes to Delicious service the usefulness of this service is currently uncertain). As Ranjit points out “the ICO helping organisations comply and improve rather then jumping out of the blue on organisations naming them as illegal and shutting them down“. He points out that some sectors seem to be doing badly. If the higher education sector can be seen to be implementing appropriate and achievable best practices, respecting users’ needs whilst understanding the difficulties in blunt implementation of the legislation this will be beneficial for the sector as a whole. I do hope you will spend a small amount of time in giving comments on this post and on Claire’s, in providing links to your policy statements, so that others can learn from their peers and in documenting other aspects of this work which may be useful to others. It should also be remembered that ways in which we should respond to cookie legislation will go beyond those working in institutional Web management teams. Clearly it will also be important for institutions which have a devolved approach to Web management. But responsibilities must also be shared by individuals who provide Web content, whether hosted within their institution or by third party services. I have just added a widget on the right hand sidebar of this blog which describes how WordPress.com, who host the blog, make use of Google Analytics. I have gone beyond the issued of cookies by reminding people who leave comments on this blog that they are required to provide an email address. I have now published a policy which states that such email addresses will not be disclosed. Is this an approach which we can recommend to others? How Should UK Universities Respond to EU Cookie Legislation? The EU’s Privacy and Communications Directive comes into force at midnight tonight (26 May 2011). This requires user’s consent before using cookies – the text files which are used for various purposes including storing browsing information. hope that browser suppliers make the necessary changes soon enough such that website operators need do nothing. Perhaps we should be looking to the ICO to see how it has implemented the legal requirements on its Web site. As can be seen from the following image the ICO’s Web site has introduced a new text area at the top of every page which requires users to click on the accept box. I think it is clear that this is a very flawed solution. Not only is it very ugly, but it also appears to force users to accept cookies (not the message “You must tick the ‘I accept cookies from this site’ box to accept” was displayed after clicking on the Continue box without selecting the option to confirm acceptance of cookies. One problem sites are wrestling with if the ICO insists on enforcement is a catch-22 where if people choose not to accept cookies, then sites will have to keep asking them if they want to accept cookies – because they will not be able to set a cookie indicating their preference. This provides the UK higher education sector with an opportunity to develop and implement appropriate and implementable solutions. We are seeing the Government providing indications that is looking to see “business-friendly solutions” being developed. Ed Vaizey, the Communications Minister, has suggested that the EU directive is “a good example of a well-meaning regulation that will be very difficult to make work in practice“. Perhaps this is an example of Government policies being in alignment with those working in higher education who wish to continue to make use of Web technologies to deliver a wide range of services. How should the sector proceed? I feel it would be a mistake for Universities to work on their own in attempting to implement individual solutions based on institutional interpretations of the EU directive and trying to second-guess what may be deemed to be acceptable practices. I am in agreement with those who suggest that the opt-in/opt-out requirement should be provided by the Web browser rather than on every individual Web site. It should be noted that Microsoft’s IE 9 and the latest version of Mozilla’s Firefox offer settings to protect users from services which collect browser data. In addition Google is working at integrating so-called ‘Do Not Track‘ technologies into their Chrome browser. In addition to such developments to Web browsers it may be appropriate to explore the potential of machine-readable privacy policies such as W3C’s P3P standard which I discussed in a previous post. Although this standard has seen little usage since it was first published in 2002 the EU legislation might provide the motivating force which can encourage greater take-up. At UKOLN’s IWMW 2011 event, which will be held at the University of Reading on 26-27 July, Dave Raggett will be giving a plenary talk on Online Privacy in which he will describe his EU-funded Privacy Dashboard work. The event might also provide an opportunity for those working in Web-management who have a good understanding of the implications of privacy policies on the services they provide to agree on a sector-wide approach which can be deployed in a year’s time. There is a slot which is currently vacant at the event of the event. There is therefore an opportunity for a small group of University Web managers using the next two months to develop a proposal on how the sector might implement the cookie legislation in a year’s time. Why cookies are needed and what concerns they raise. A briefing paper explaining these issues to policy-makers and end users. The briefing should have a Creative Commons licence which can help to demonstrate the efficiency savings being made across the sector by avoiding duplication of such work. What privacy policies should cover and possibly provision of privacy templates. Policies on preferred browsers and education on use of privacy preferences. Potential of use of machine-readable policies such as P3P.